Right on G Monkey! I am working with a few students right now on that! Thanks Shawn. Delighted to have your input !!!!!! I think I may have found another profound misinterpretation of intent of mine. Its about my thoughts with relation to release of lag. Now I have worked on my rotation and hip action Im finding that it is much more intuitive to release ealier in the swing. Gradual release through the swing just as Gary told me a while back. What I was doing was hinging early with the wrists and then firing them late with the swing. I actually noticed this because of fishing cast. I realised I was also doing this in a baseball swing. The same mistake. Cocking early and then swinging the bat (club) way too late and with a cramped feeling release way too late. So im now feeling like after the drop (falling down the plane) both my arms and wrists are being released and not just my arms and then wrists. This does not produce a casting action because now my rotation is better. In a latteral move this sure would give me a cast because the inertia point of the swing is different for those that need to stand up during the shot because of lack rotation. I think I might finally understand the take away wrecking ball analogy. It really does not work if you (like me) got the pivot intent wrong. All it did for me was relocate my sturnum and head but now my hips are working the WRECKING BALL take away finally works. For other people if a Shawn analogy doesnt work for you then make sure its not something you are doing that prevents it from working. Odds on thats the issue. I went to the course last night with the hip action sorted out. I did still EE but not nearly as much. The hip action change has given me a few options that were not available to me with the more linnear movement. Im still getting the arms and hands and club extending due to the inertia of the swing force. You guys have found a way to avoid that and I have a few options. Do you guys feel like you swing the club with your core??? This does take the feel that you are not swinging the arms as much or certainly that the extention point is past the ball. In fact I do feel like its more a swing of the arm-club-unit rather than swinging the arms and letting the wrists activate. I must state that I have tried what I would call a core driven swing before with bad results but I have never tried it with the hip action corrected. This may work with a much more rotary core action. If you try this with the lateral hip feeling you just push shot. So thats next up for me. A core driven swing of the arm club unit in combination with the new hip- spine feeling. So I failed last night and will upload now. You can see its still EE. Sometimes failing is good as long as you know why you failed. For me it's more a feeling of the core strength allowing the body to maintain posture against the increasing pull of the ACU. Hence preventing (EE) from taking over. Think of it as resisting the ball and string from extending your arm as the ball is made to go faster. For me it’s more like turning to the right and then lifting the arms. Two actions, one after the other. If I manage to have the elbows close together, then I had a full turn and both arms can do their anatomicaly correct move (up). It‘s like the typical Volleyball move, if you receive the ball with both underarms. If I have issues (typically too much too the inside) I ask myself, are the arms moving up IN FRONT OF THE BODY? That helps most times to do it better the next swing. Ok here it is. Im still swinging the hands on this video but I have the new hip action in place. Im going to try swinging the club arm unit with the core next time. The new rotary hip intent will allow this. 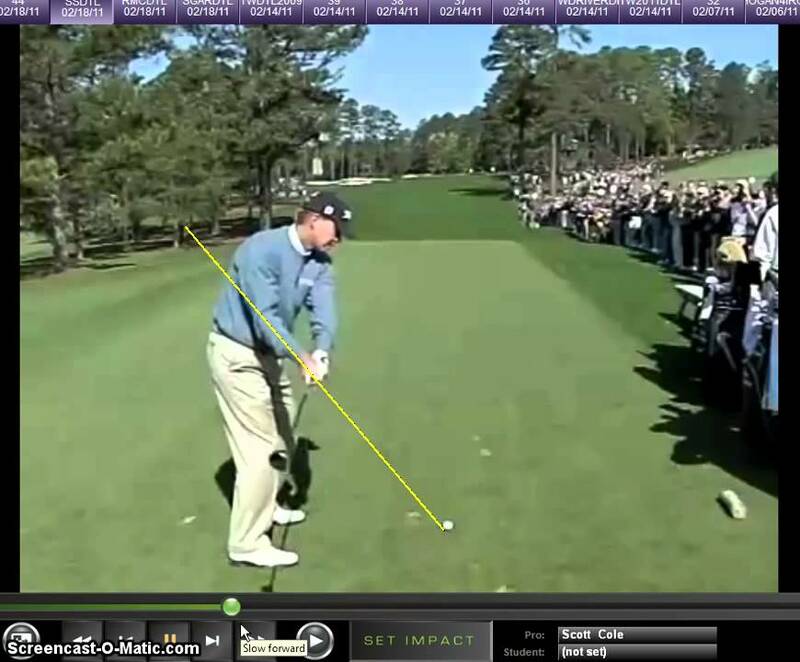 I have swung the club like that before but it didnt work with the old hip intent. Im hopeful. Im also gonna simplify my hands on takeaway. There looks to be early rotation error . Cost I did the practice swing for you. They look pretty much the same. Its not like they look too much different to be honest. Both hands and EE. Anyway Ive detailed the next changes so ill report. IMHO you have no width in your back swing , which is forcing you into a lot of hand action to save your EE issues. A good observation but is width a result or action? If I simply decided to get wider then Id probably cast the club. I will look at what lets me get wider in the swing. Unless you can tell me? If you read my recent post carefully, you saw the remark about the ellbows close. Make a test. Stand straight and rise both arms parallel to the ground, shoulder high. Both arms are same length (of course) and you have no issues to bring both palms together, while there is no break in one or both elbows. That is the maximum width you can achieve with the arms. Remember my comment of the arms in front of the body? Do the same test and don‘t have the touching hands in front of the sternum, move it e.g. in direction of the right shoulder or even beyond. Do you feel the stress and the tendency to avoid this stress by breaking one arm in the ellbow? Yes, the right ellbow will bend somewhen during the backswing, but only during the later wrist movement, Shawn refers to that as setting the club using the anatomical snuff box. There are some videos about that. Bottom line, no full width is typically because of bending the right ellbow too early, caused by not having the arms in front of the body, but instead too inside. Please also check out the famous Waldron YouTube video about body-arm illusion. Final word, don‘t try to achieve width by swaying to the right side, stay centered. Hi GM - Buenas Dias WIG Devotees far & near.. I've been following along - and hope to contribute a little if I can to advancing the journey..
and .. 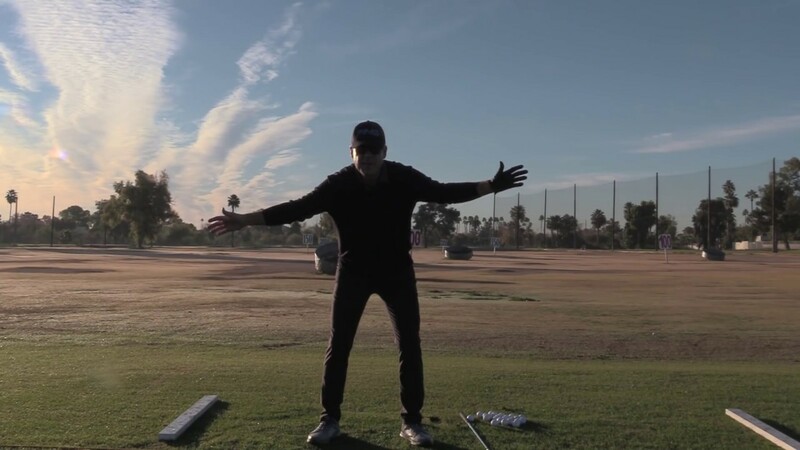 I'll try to keep this out of the 'golf jargon weeds' that I can so easily fall into..
What I think I see is that you've worked out a way to make your backswing and downswing to work on the same plane. That's pretty cool - and from what I see at the 'top' is that you're looking with your right eye where you intend to bring the club back through the line that you see to advance the ball. so I'd ask the question .. are you aligned as 'train tracks' or parallel left to the target ? that's what it looks like from here.. and that's OK .. but it will contribute to some potential challenges in terms of total potential speed later. I'm trying not to put words in Alpine's or Ken's prior posts .. but you can see Alpine mention a sort of 'up down/lift' and Ken talk about a 'lack of width' .. both are correct and to my 'ears' are talking about 2 qualities that would be desirable in a golf swing depending. Depending on either - getting more of a 'drop from the top' .. or getting more 'width' to take advantage of your body rotation. You don't necessarily need both together .. in that it can make a swing with too much going on .. too tough to time. So I'll use Ken's observation for the moment - and say a swing that is working in a way where it goes more or less 'back' to where it could just drop back down relative to the body turn.. and for me the best I ever saw at the Pro level would be Steve Stricker..
he is working from a similar concept as yours .. works to a sort of 'maximum width' and as he turns the club works around and back through the ball..
it's potentially a valid thing for you to consider.. I don't know enough about how he aligns to say whether or not that will fit how you're potentially visualizing your shots and standing to them. The 'Up & Down' that I'm probably misinterpreting from Alpine but is present in many of what are considered 2 Plane Swings .. have a more distinct 'drop' from the top of the takeaway to the throughswing ..
this gets complicated .. but I think you recently put up a video of a Surf Casting Fisherman.. if you can .. just watch the tip of his Fishing Rod .. relative to his body turn .. it drops or flattens radically as he is turning back through .. so the tip is lower and flatter .. and has taken advantage of a 'free gravity drop' before it works most effectively with the rotational energy /timing of his body. this isn't a perfect video to see this .. but it gives you a similar angle and speed .. and his some of the same characteristics .. Andrew 'Beef' Johnston.. watch his hands at the top vs. the 'through' swing ..
you'll see his start a bit higher relative to your 'top' .. but find their way 'down' more or less to where your hands are and their way back 'through' or 'around'..
so the rhythmic backswing has added a bit of 'mass' to the head and shaft of the ACE .. and gravity will work 'down' but while turning .. so watch his hands relative to his right shoulder and of course, watch the clubhead ..
so.. right now . I believe you're working on what constitute elements of timing for your swing .. in that as there is minimal drop .. but a predictable through line.. your only manageable variable is getting enough turn and speed working 'through' .. but without standing you up and out of the swing..
so it's in your hands and hips .. the more 'around speed' you generate .. the byproduct is some of that energy working you 'up' .. so the experience would be a bit like trying to stay 'over' or 'covered' ..
the short of it .is that you've likely maximized what you can likely generate from your existing swing. There may be days where you find something that optimizes it and have it grooved and working .. and get better results .. and those will be very fun days. There will be days where your timing won't quite work and you'll struggle a bit more.. and adding power will not help..
either way - you have been playing to this .. and have been shooting some decent scores .. that's not an accident, you're clearly a good athlete and the ball seems like it's coming off the face of the club with great speed. This will come down to what your priorities are .. do you want to just play with what you have .. or are you trying to perfect something that may take a long time to work out .. and potentially make it harder to enjoy playing .. the feared 'in between' in golf..
and .. there's a good chance that I could be looking at this incorrectly .. for what it's worth - I wouldn't put this kind of time into a response if I thought it was 'off base' but .. at the end .. I'm just another set of eyes looking at it .. I don't believe that you can rotate much more than what you already are.. so that leaves hands/hips to try and add tempo.. that will give you some EE relative to the rotational forces .. and make it a little tougher to see and time..but it's absolutely possible..
so that leaves 'drop' .. I'm not the 'poster boy' for this .. but I had to learn it with takeaway path .. my flaw is to work 'in' .. the old .. 'too much turn' .. which shortened my swing and made it hard to time ..
but I worked hard to see a better line and stay committed to it .. and put some things to show me the proper backswing line and resulting clubhead path to stay with .. I don't say that lightly in that while it can ultimately offer you 'better' .. it will also retime your swing and potentially leave you in a sort of 'swing wilderness' .. but that is one way you can build a bit more actual width and potential drop..
so .. just one Crackpot Golf Theorist's opinion .. I respect your journey, your hard work and your courage & willingness to share it with us.. believe me, I understand some of what you're working with and through.. and I've had people try to help me find things that existed outside of what I thought I knew or understood .. every year / every season sometimes every round I learn something new.. and often it comes in a way that challenges what I thought I knew..
one day .. I hope that we can tee it up .. no idea where you are in the world and where and when we can play.. but that's the nature of the great game ..
Harvey Penick said it so well.. 'if you play golf, you're my friend' .. and with all his great wisdom .. he would only charge a few dollars for a lesson.. I'm not sure what lesson he was trying to share with that .. but I suspect that one of the cornerstones of wisdom is humility..
that's the best I've got for now ..
hope it is of some use to you in 2019. PS - hopefully you and other readers would see that the most important aspects of my response were about identifying where potential speed will or won't come from and what width and drop might potentially appear in a swing as.. in forms including but other than WIG as well. 1. To Ken's point, I agree that you can do with a bit more width. To your question, I believe that width is an ACTION; not a "result". To get more width, take a look at our RIGHT-elbow at the top of swing? (2:10 of the video) and see if you can EXTEND your hands FURTHER AWAY from your HEAD? Check to see if your Right-arm has "collapsed"? From this angle, it is hard to see?? At this point in your swing, Right-elbow should be pretty close to 90-degrees. I'd be willing to bet that we'd find your Right-forearm is smushed right up against your bicep? 2. Again, tough to see from this angle, but it appears that, at Address, your Left-foot is somewhat FORWARD of the ball? As the player, sometimes proper alignment can be difficult to identify? Here's my test: With the club-head in its "soled" position, set the Shaft PERPENDICULAR to your Target-line... Now set your feet so that the shaft of the club (in that perpendicular position) is pointing to the center of your left-thigh. This out-of-position at Address can, in and of itself, contribute to Early-Extension? And here's the point(s) to which I've previously alluded, and that you're probably not going to like or will deny? Do you believe at all in "body-language"? I do, and here's the two evidences (IMHO) about you being a bit "BALL-focused"? 3. 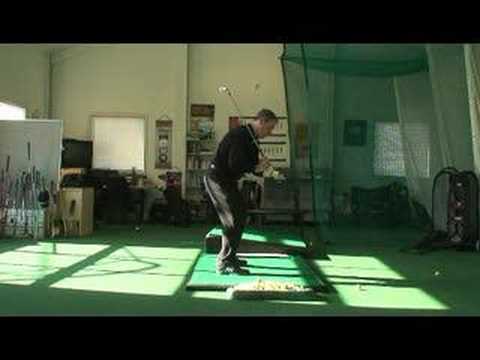 At the top of your swing (see 2:10 of the video as above), check where your Left-KNEE is pointing? Right AT the ball. That not only INHIBITS your hip-rotation, but (in my experience and observation) is indicative of what/where your MIND is "focused" at that point?? Proper hip rotation will result in that knee pointing to the REAR of the ball at that checkpoint. You then stare at the ball for a full THIRTY "ticks" before beginning the take-away. You never returned to the target? The resulting swing takes seven "ticks". I would suggest that your time-distribution is backwards? Stare at the Target; glance at the Ball. It is my opinion that by the time you begin your take-away, your mind has "forgotten" about the Target? and is now focused upon that at which you've been staring for the past 30 "ticks". I'll go away quietly now and leave you alone. Hope it is of some help, and no offense intended. Last edited by COSTA103; 3 weeks ago. Hi Alpine. I have seen that Waldron video. But yes I can see and feel when I swing I have a the Lawnmower pull going on. I think this is indeed what Ken was talking about above. Im not wide and out in front. Even with that 'lawnmower pull with right arm'. You are right about that. Even though I promise you my swing thought is not around the body. It is very similar to how Waldron describes. But I think in lazy ease of motion im pulling in with right arm. Yes agreed. To be honest looking into it now it feels very comfy to have my right arm at my side rather than out in front. So is that a reaction to the EE or the cause or bad intent somewhere up the line? Ok plenty to work on and you have indeed clarified Kens point. Kid my old mate. Thanks for the post. Im really hoping the new body swing intent will allow me to do this and get width. Im not going to stop until I feel I can make a golf swing with proper true intent that I understand. I have taken many many years to get this far and I have no intention of stopping now. I can speak 'golf' so suggestions and ideas are quite easily communicated. That is why I welcome all comments. Nope im not going to settle for shooting between 7-14 over par. Once I sort the EE out (and I will sort it out) then I will be low single figs and look like it. Im 100% convinced. I play many sports that require rotation and if I time the stand through my EE you can see the ball goes miles. But I know that this is not correct. It is all about the physics and matching the intent to the physics. Im pretty much certain I dont have any physical limitations even though you have compared me to Beef Johnson hahahha. I must lose weight. The top makes me look bigger than I am hahhahaha. It did take a bit of corrage to share my swing. Its not easy to admit that you have been pivoting wrong, too handsy and stand up through the ball. But you guys are helping me and im way further down the rabbit hole. One day im gonna work out the swing force that avoids the EE and start ripping drives but with a way smaller margin of error. My eyes are always on that prize. I know im never gonna be Rory on tour but if I can understand what is required then I can at least see what im capable of with the proper intent. Ok love it guys. Will report back. Cheers Ken, Alpine and Kid. Just saw your post Costa. Always love your input. Never offended. You gave me a lot of information there. Ill work my way through it. Problem is that feel aint always real. I have many times denied I do something because I dont feel I do it. Id probably deny my EE without having videoed it hahahah. So im way past being precious. I very well could be ball focused. I dont feel I am but I know all too well that I could be. I will look through your stuff and post soon. Last edited by Gmonkey; 3 weeks ago. appreciate your consideration of my ramble.. and absolutely no inference intended by using 'Beef's' swing as a model - it was just something where you could see how he put the club into play in transition.. vs. how Stricker did it..
to maybe blend a bit of what the Dude was sharing with what I'm hoping to illustrate is get a notion of how you're visualizing your actual alignment to your target and resulting flight. Again this is coming from an 'eye-hand' guy .. so it may not speak to you .. but I never could get a lot of this being 'open vs. closed' and clubhead relative to such and such until I literally marked everything out and could help myself visualize things. That may not work best for you .. but I believe that until you get a sort of objective distance of how you see what you see .. it's tough to get a sense of any sort of useful analysis. I guess to me . until I had some kind of useful context .. and understood how I was arriving at that context .. trying stuff was like fighting the tide .. whatever I built would eventually be washed away ..
and yep, still can and does happen.. but less of it now.. and longer lasting and better learning & understanding..
your path may vary but I suspect will be just as valid .. In the old forum it was a nice tradition, to use Shawn to explain it by posting a respective video. That simple exercise at the beginning of the video is a fantastic and easy understandable way to realize the link between body turn, width and collapsing arms.